As CEO of Nijhuis Industries, Menno Holterman has the opportunity to experience water challenges across the globe. Nijhuis, founded in 1904 and headquartered in the Netherlands, provides consultancy, design & build, maintenance, and operational services for industrial and municipal wastewater projects on every continent. In a keynote presentation at BlueTech Forum, which took place in Dublin, Ireland on June 6-7, Holterman shared many of those learnings. Prior to the Forum, I took time to find out more about his perspectives on water reuse and sustainable water management. "Water challenges around the world are driven by many things," says Holterman, "but especially water scarcity, a lack of groundwater and aquifers drying up. I believe industry is making a great deal of progress, which is what we see in a lot of our projects around the world. "We see clients now actively asking for integrated solutions, including finance and operations & maintenance, which is a seismic shift. We also see a lot of industries, including those that [were] invited to participate in BlueTech Forum, making water reuse, for example, mandatory." "Nijhuis is working with big corporations like Nestle, Mars, and Unilever. Until about two years ago, water reuse was always requested, but only implemented in water-scarce areas, because of the high cost and not having a business case to pay back the investment. Now we see that all the large corporations are making reuse mandatory not only on greenfield projects, but on a lot of brownfield projects and upgrades and expansions of existing plants." One of Nijhuis's key clients is the French cosmetics company L'Oreal where trials on wastewater reuse have been underway at the company's largest production plant, which is situated in Poland. Holterman says he sees Nijhuis Industries' key global accounts taking responsibility and starting to implement these kinds of measures. However, currently, the recycled water is only used for non-core processes and non-product water. "It's only a matter of time before some clients start reuse across production," he says, "especially in areas of water scarcity. This is an important question for us to discuss at BlueTech Forum — why are some industries hesitant to reuse effluent in their production processes? "There are still a lot of brands that do not want the product water to be originated from treated effluent, so they want to discharge the water into a river and pick up the water hundreds of meters downstream, take it in, treat it, and use it as product water. But to take it directly from the effluent treatment plant back into the process or mix it with water originated from treated effluent is a no-go area, especially in the food, pharma, and cosmetics industry, for mostly psychological and marketing reasons." Holterman believes the influence of other industries will ultimately crossover to the food and beverage industry, especially if you are operating in an area like Africa, India, China or Mexico where water scarcity is having a huge impact. The only options may be to reduce production capacity, close down, or relocate the facility or use the water in a different way. He explains, "Most investment in new plants is made with a financial horizon of 20 to 25 years, so you have to make sure you secure sufficient water to operate a plant, secure their license to operate, and meet their growing production requirements. It's not always easy, because you have to expend more energy in order to recover the water. So in terms of the water-energy nexus, it's necessary to identify the tipping point between investing in additional water capacity versus the amount of energy you have to expend. "I'm back from a trip to China where I've been visiting cities surrounding Beijing that are responsible for mass food production and they are running out of water. They don't have desalination capacity installed and they need alternative sources of water to feed hundreds of millions of people. "The saltwater intrusion into the aquifers is a major issue — up to 40 to 50 km from the coastline — and I had meetings with mayors of cities of 800,000 to 1.2 million inhabitants and the cities are growing. I visited one city where they have an additional 100,000 people arriving each quarter and they are looking into alternatives, not only by putting desal capacity next to a municipal WTP, but also water reuse." At the other end of the scale, Holterman describes a ‘pee and poo collection' project that Nijhuis has initiated in Ghana with some local NGOs. 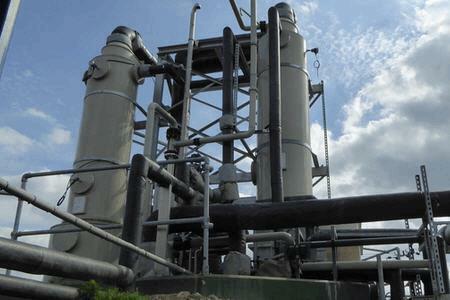 Anaerobic digestion is used to convert biosolids into gas and a new business model has been developed in the process. "So the work that was done by night-soil collectors in 19th century England, Ireland, and the Netherlands is going to be done in a more hygienic, efficient way in modern-day Ghana," he explains. "Once collected and transported to the plant, the faeces are converted into cooking gas, which can be purchased and used on domestic stoves. "We are taking what is done on large-scale municipal plants, and scaling for use in small-to-medium cities with 30,000 to 100,000 inhabitants — providing them with a business model and securing affordable solutions for sanitation, clean water, energy, and jobs." Another region of interest for Nijhuis is Argentina, where the Government is closing landfill sites to drive waste recycling. The capital, Buenos Aires, has decided not to allow any incineration within 30 to 50 km surrounding the city centre, so municipalities have to look for alternatives. Holterman says, "The waste is already collected by the municipalities so one solution might be for them to bring it to our facility, which we would operate with the municipality. We would sort the waste and create value for our client. "There is a good market in Latin America for recycled materials — plastics, aluminum, steel, glass. We would concentrate the organic waste stream to create energy by anaerobic digestion, creating power through a combined heat & power (CHP) system. "The leftovers would be co-digested and that co-digestate converted into fertiliser and clean water. The last undigestable part can be used by the concrete and cement industry as part of bricks and paving. Some 85 percent of the waste is going to be reused and 15 percent landfilled or incinerated elsewhere." One of the themes of BlueTech Forum 2017 was the 4th Industrial Revolution and Holterman sees the Internet of Things and low-cost sensor technology helping treatment plant operations, providing a massive boon to the way Nijhuis operates plants globally. "The Internet of Things, this sensor technology, is going to help us tremendously and we are already going to the next stage in developing software which will help us to predict the behaviour of the plant if the characteristics of the water are changing. With Nijhuis i-Monitoring solutions in place, we support customers around the globe in operating and maintaining their plants against the lowest possible total cost of ownership. "This data is also a very valuable resource to verify the design criteria of the extensive range of Nijhuis technologies and provide critical input to our R&D, design, and process engineering teams to design and build even more reliable and cost-effective solutions." This was the fourth year Holterman attended BlueTech Form and he was enthusiastic about the intensive agenda and valuable networking opportunities. "BlueTech is trying to bring value to a very different landscape in the water technology space," he says, "and trying to open up that space and present innovations. But at the same time, trying to be critical as well, which is what I appreciate. Only by challenging each other can we improve. "The water issues in the world are very demanding so we should not waste our time getting on the wrong horses. It's important that our critical advisors in the water value chain are trying to make things more transparent. "Setting up an event like this, where you have 150 to 200 visitors looking to exchange views and ideas and be inspired to look for potential implementations in their own companies and institutes is a valuable format to actively participate in."